Digital Marketing Organic SEO is today’s in strategy! 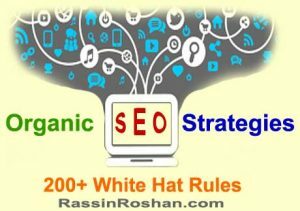 Rassin Roshan seeks to educate Business-to-business, B2B, and Business-to-consumer, B2C, in regard to white hat SEO, the knowledge of how to organically increase the search performance of your site. In almost every instance, we are connected to the Internet. As a marketer, we read, analyse, and find ways to enhance the usability of websites. As consumers, we are searching for the best company who can deliver the best product in a fast and safe way. Today, Digital Marketing is an industry that attracts all sorts of marketers worldwide. Almost every company has a digital marketing team who helps the growth of the company in settle ways. The digital marketer must understand what the company’s mission is. In other words how to measure your performance against key business objectives. Analyse your past and move forward, communicate calculatedly with your different audiences, identify your budget, outline a Digital Marketing Organic SEO plan that you can execute, and update your website to reflect all of these and more. The power of Digital Marketing and all its components enhance your website performance on the Internet. It is highly advised to execute all of the following phases on an existing website or a newly optimized website to comply with today’s Internet rules. These Search Engine Optimization, SEO, tools will rocket your website strategy, and you will be found on major search engines. For years, Google, has dominated the search engines and we all want to be there! After fulfilling the organic aspects of a healthy website, then it is essential to create social media presence and interaction. This can be a good strategy for healthy back-linking.